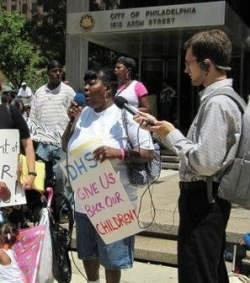 Carolyn Hill still remembers the night, two years ago, when the Philadelphia Department of Human Services (DHS) came to take her nieces away. The girls, ages 1 and 2, had been placed with her about a year earlier, after being removed from their mother’s custody due to her mental health issues. Hill thought she’d begun the process of adopting the girls: She’d taken parenting classes at the request of the agency and had begun paperwork so that she could go forward with adoption. Two years later, she still isn’t sure why the girls were removed from her custody. The answers, she says, keep changing. The agencies brought up a drug conviction for which she served six months’ probation in 1999—something the city knew about when she first took custody of her nieces, she says—and accused her of having mental health issues because she possessed Ambien to help her sleep. They also complained that she did not have a GED. Hill began to seek ways to get her nieces back, and soon found an ally: Every Mother is a Working Mother Network (EMWM), a Philadelphia- and Los Angeles-based group that works to combat the devaluation of parenting labor, particularly as done by low-income women of color. Members of the group have advised her, helped her find a lawyer, and will be available to testify that she would be a fit parent for her nieces. Hill says her custody problems began in the fall of 2011 when LCFS took over her case from another subcontracted agency, several months after the city placed the girls in her care. LCFS, she says, came out to conduct a parent capacity evaluation of her and get a GED. She was told she had until July to enroll in the GED program; but, she says, the social worker came to collect the kids in April. Since then, she says, it’s been a series of shifting goalposts and misinformation. The DHS, according to Jones, said in writing that they’d support the children being returned to Hill, and then reneged. Even with a lawyer representing her and the support of her community and EMWM she hasn’t been able to see the children since January. It’s not just Philadelphia that has had problems with social services and privatization. Indiana attempted to privatize a chunk of its health and human services in 2006 and wound up considering banning privatization of Medicaid and food stamp management because users had so many problems getting services. Back in 2000, a Denver Post investigation found that Colorado was spending millions on private agencies that oversaw more than half of the state’s foster children and pocketed more than three-quarters of the money spent on foster care. And not far from Philadelphia, a scandal rocked Luzerne County, Pennsylvania, in 2008 when juvenile court judges were found to be accepting kickbacks from private juvenile detention centers in exchange for funneling kids into their facilities. Dorothy Roberts, professor of law and sociology at the University of Pennsylvania, attributes the current punitive trends in social service to a neoliberal ideological framework that believes private solutions are the best answer to social problems. Roberts has spent decades researching child welfare systems. Her 2001 book, Shattered Bonds: The Color of Child Welfare, argued that current policy reflects a political choice to punish families rather than address the societal causes of black poverty. She has noted that about one-third of children in foster care are black, despite black children making up only 15 percent of the nation’s children. The end to the welfare safety net coincided with the passage of the Adoption and Safe Families Act in 1997, which emphasized adoption as the solution to the rising foster care population. Both can be seen as neoliberal measures that shifted government support for children toward reliance on private employment and adoptive parents to meet the needs of struggling families. This convergence marked the first time the federal government mandated that states protect children from abuse and neglect without a corresponding mandate to provide basic economic support to poor families. Both the welfare and foster care systems, then, responded to a growing black female clientele by reducing services to families while intensifying their punitive functions. The main mission of child welfare departments became protecting children not from social disadvantages stemming from poverty and racial discrimination but from maltreatment inflicted by their mothers. This is the same point made by Jones and James; instead of fixing poverty, Roberts notes, the state “addresses family economic deprivation with child removal rather than services and financial resources.” It stereotypes and punishes low-income African-American women as “aggressive” and “cognitively delayed” without questioning those labels. Officials are often blatant in their assumption that black parents, particularly black women, are incompetent. Women like Carolyn Hill. Meanwhile, Waxman pointed out (using 2008 numbers), “If the DHS budget were divided by the number of children it serves, each one would get a check for $34,000 every year.” That might do more to solve the problems caused by poverty than removing those children from their homes. EMWM points out that when the state is overstretched in taking children away from families whose only problem is poverty, it can miss the cases in which a child actually is in immediate danger. That danger, James says, can come in part from women being economically unable to leave dangerous circumstances—women who face domestic violence, she points out, sometimes have their children taken away because they themselves have been abused. And right now, in Detroit, as water is being shut off to thousands who were late on exorbitant bills, parents fear that if anyone finds out they don’t have water, the Department of Human Services will take their children. The fear of losing one’s children then becomes a barrier to asking for needed help. On June 11, Carolyn Hill went to Family Court for the latest hearing in her two-year fight to adopt her nieces. She had lined up 12 witnesses to come testify on her behalf, including family members, friends and neighbors, the pastor from her church, who used to see the girls with her every Sunday, and five members of EMWM. They were all on a list provided to the court by Hill’s lawyer. Only one of them was allowed to testify, Dr. Steven Samuel from Jefferson Hospital, who had evaluated Hill and found her able to care for the children. Meanwhile, according to Hill and Jones, the relative with custody of the children had no one listed to testify. The only person to testify on her side was the children’s therapist, who had not seen the girls since August of 2013. And yet Hill lost her case. “Every time they asked me a question and I went to answer, they’d tell me to just answer the question yes or no,” Hill says. “Because family court is closed, all kinds of misinformation can go on, we don’t know what goes on behind closed doors,” says Jones. Hill has filed a new appeal. Meanwhile, she hasn’t seen the children since the end of January. “First I was seeing them four times a month, two hours every time, four hours in my home and four hours at the agency,” she says. “Then they said when the kids would come from my house they would act up, so they cut the visits down to two hours at the agency.” Then they cut them down to one hour, and then none at all. Since the 1996 welfare reform bill, low-income women get little financial help raising children, and then their poverty is used as a strike against them. They are pushed to find work because, James says, the society doesn’t see the care work they do as worthy of financial support. Money, it seems, is everything. Sarah Jaffe is a staff writer at In These Times and the co-host of Dissent magazine’s Belabored podcast. Her writings on labor, social movements, gender, media, and student debt have been published in The Atlantic, The Nation, The American Prospect, AlterNet, and many other publications, and she is a regular commentator for radio and television. You can follow her on Twitter @sarahljaffe. I am looking for help. I am homeless and unemployed right now but I am enrolled in college to make things better for myself and my children. Dcfs took my oldest when he was 7 months from his dad and said that he turned him in this of had to happen on a Monday when I could not leave school. I tried for many days to find out what happened and why. But no answer we didn’t even go to court for two weeks when I go to court the worker tells me that the reason they took my child is because of no utilities at my home. And also said I was low functioning as a mother because of some mental issues caused by them. Well that took 3 years of barely seeing my child because every time they got the chance they would cancel my visit. Which pretty often when I found out I was pregnant with my daughter they told me to get out of town and I could keep my child. Well 2 hours after she was born a dcfs worker shows up at the hospital and tells me that she is taking my child into custody. Of course I just moved here then and am homeless and unemployed right now but I am enrolled in college. Well they kick me out of the hospital because my child is ill. And she comes up missing I call and try to find out why they took her I get no response it has been 9 months and they promised to get me in housing but have not I cry every night because of the trauma they have caused me and my family. I wish there was something that could be done I feel like I’m a bad person because I am poor and homeless and I feel like no one is willing to help me. My life is ruined and my children`s lives are definitely ruined because they will never see their momma again.